Since Henry III of England granted the first Letter of Reprisal in 1243, privateers have been a source of defense for nations or colonies which lacked the means to field a regular navy. The history of privateers is, for the most part, a history of brave men defending their homelands and families from a more powerful aggressor. Daring raids and sea battles were waged by gallant captains using smaller, faster ships to gain the upper hand and defeat the enemy. Privateer Armoury swords, like the original privateers, are less polished than their more costly counterparts, but nonetheless battle-worthy. 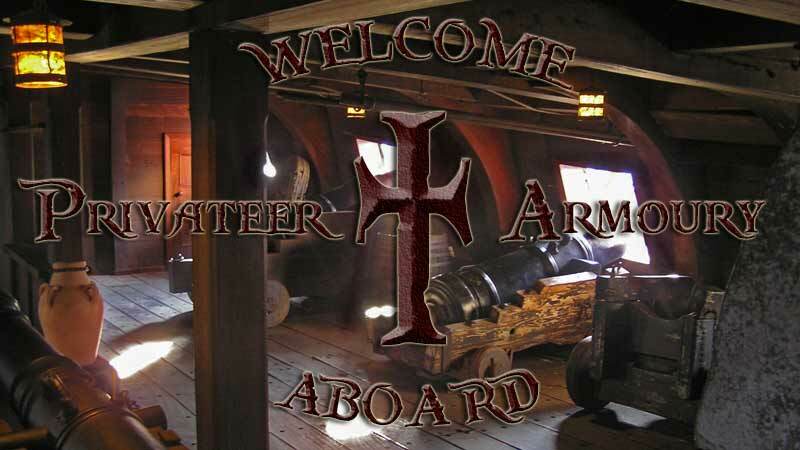 Privateer Armoury offers two different lines of swords: the more affordable Forecastle line and the more substantial Quarterdeck Line. Each Forecastle Line sword blade is hand-crafted out of professionally heat-treated and tempered 1/16 inch 15N20 Swedish steel with a no-nonsense working finish. Every sword is carefully designed to take advantage of the properties of this material, matching length and width for a quick, extreamly light, flexible blade that has excellent cutting ability, without being overly whippy. Swords from the Quarterdeck Line feature tougher, thicker hand-forged blades, with more traditional blade geometry, fullers and distal tapers. The guards are hand-forged along the lines of historical swords. With more robust construction and a higher degree of polish than the Forecastle Line, these sword are perfect for the serious swordsman. All swords have grips crafted out of a variety of hardwoods. Privateer Armoury also offers custom work to suit the taste of the individual in addition to the ready-made swords for sale.